This sauce stole my heart many moons ago when my French chef had me squish hardboiled eggs through a fine mesh sieve. I was a little bit panicky inside, because I really should have been setting up for service, and brunoise-ing veg for a mystery sauce probably would have been something I would have taken care of earlier, given the option. We served it as a special amuse bouche that night for some phantom VIPs, underneath a piece of briefly seared tuna. It was f-ing great. It wasn’t until later that week that I realized the reason I liked it so much was because it had all of the components of a fish & chips-style tartar sauce. The stuff you ask for extra of when your Dad takes you to the beach for a greasy lunch. I love it when classic flavours can span fine-dining, to the very most casual classics, and now to the healthy, nutrient-dense world of food. 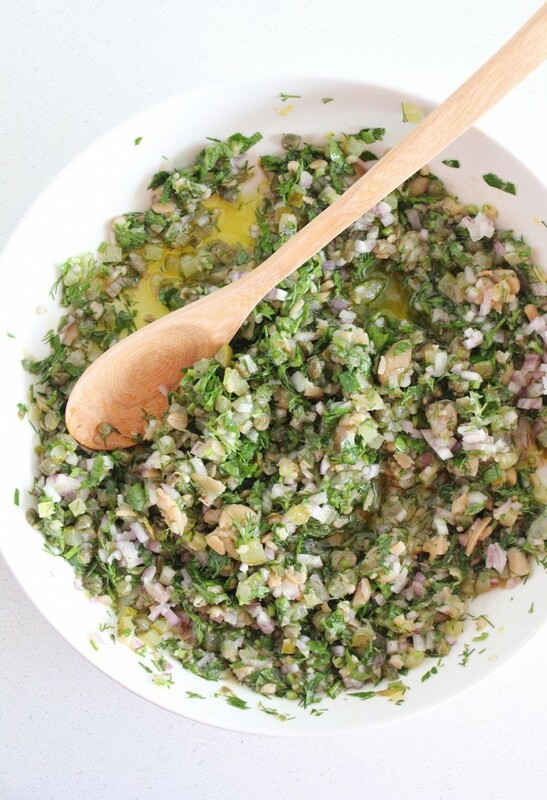 If you were to Google pictures of gribiche sauce, you would get pictures ranging from mayo with green stuff in it, to a broken vinaigrette with green stuff in it. Our version resembles more the broken vinaigrette in style, but because the green stuff is more important to us, we have amped it up in a big way. The eggs in the classic recipe either turn this into a mayo, or if hardboiled, give it a not quite mayo, creamy texture. We swap them out for white beans, which have a similar effect, while adding plant-based protein, fiber and cancer-preventing phytochemicals. 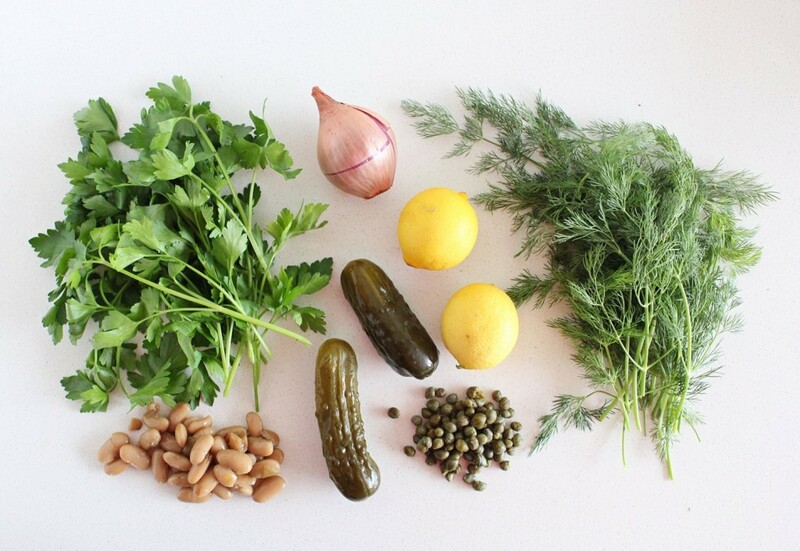 The flavour punches come from big handfuls of fresh herbs (we’ve used dill and parsley, but chervil, tarragon and chives would work well in there too), fresh shallots, fermented pickles (in place of the more traditional cornichons) and briny capers. All of this is brought together and rounded out by your best extra virgin olive oil (the stuff that someone brought home from Provence for you, that you’ve been saving for no particular reason). 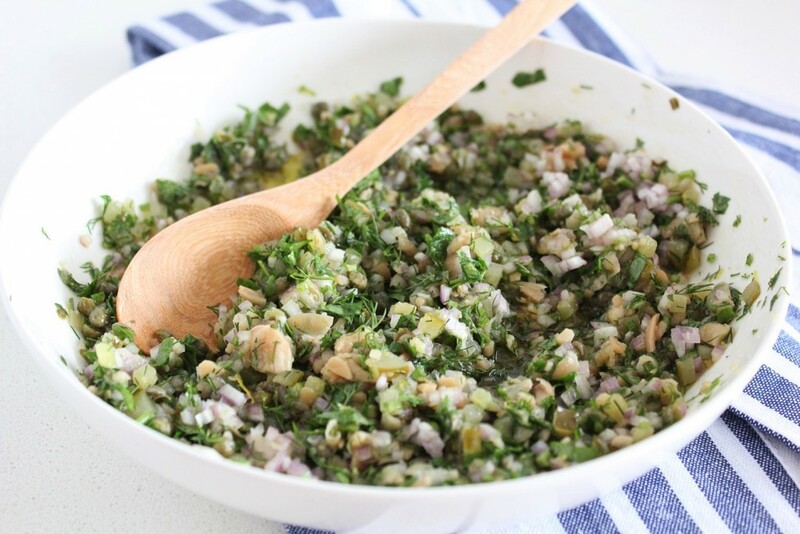 Thanks to the pickles and capers, this sauce is salty. It’s not meant to be eaten in the same volume that you may or may not eat guacamole. But the benefits of the healthy bacteria in the salty pickles (especially if you make your own, using high quality, mineral-rich salt) to your gut/immune system, outweigh the salt issue. 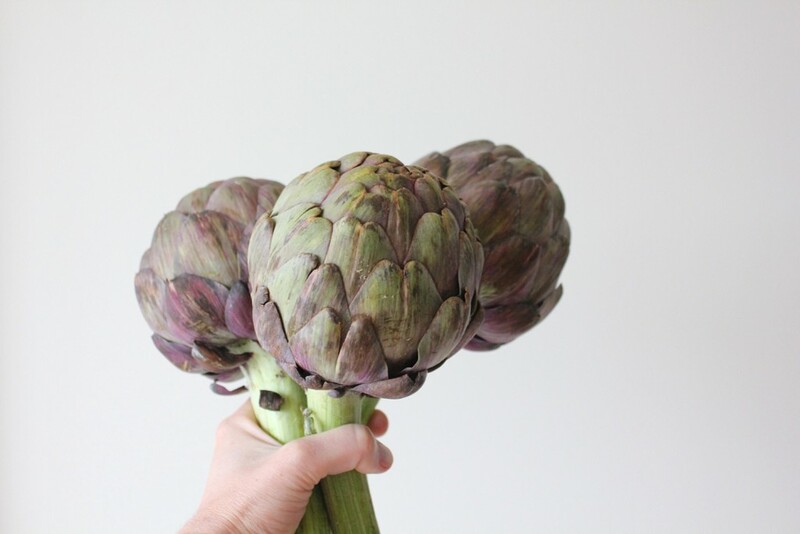 This is classically served on a bed of roasted or steamed asparagus (‘tis the season, so go for it!) 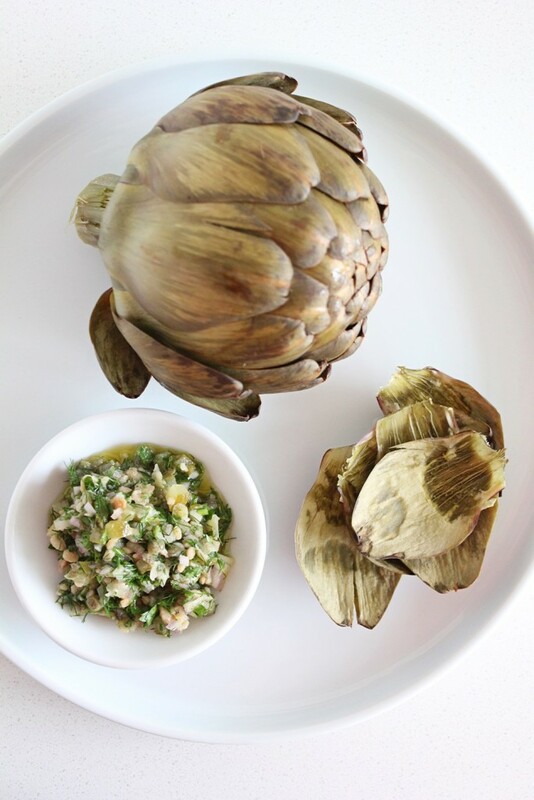 but it is also ridiculously good served on a beefy slab of roasted cauliflower or as a dipping sauce for steamed artichokes (have you made these yet? You must!). 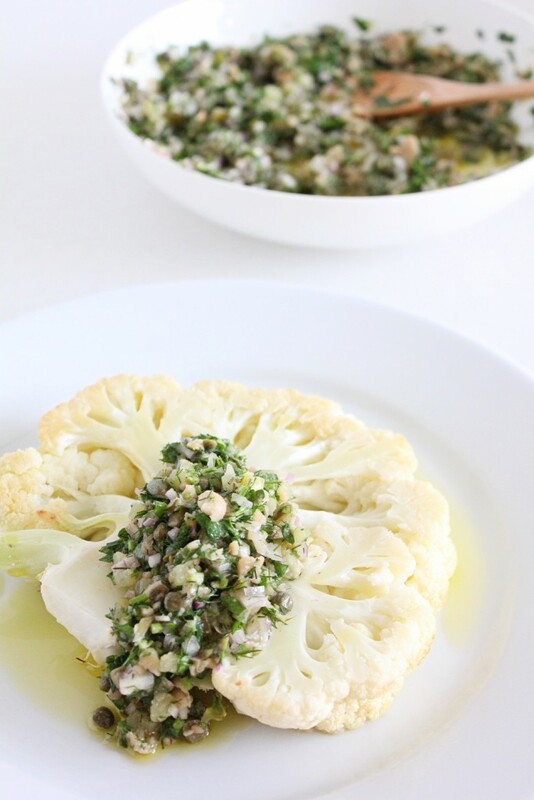 It will keep in your fridge for at least a week or two, especially if you keep it in a jar, covered in the olive oil. The green herbs will start to turn brown (pickle-coloured) pretty quickly though, due to the acidity in the pickles and the lemon juice. 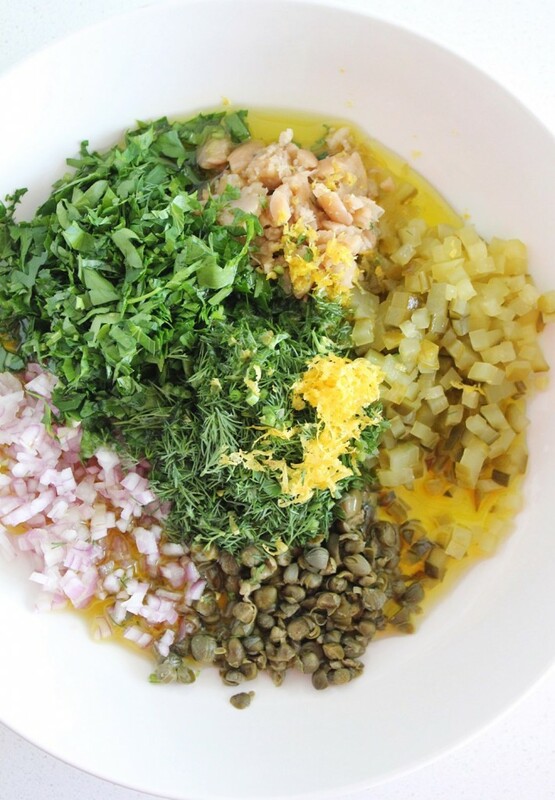 If you want it to stay fresh and vibrantly green, mix everything together except for the herbs and add them right before serving. 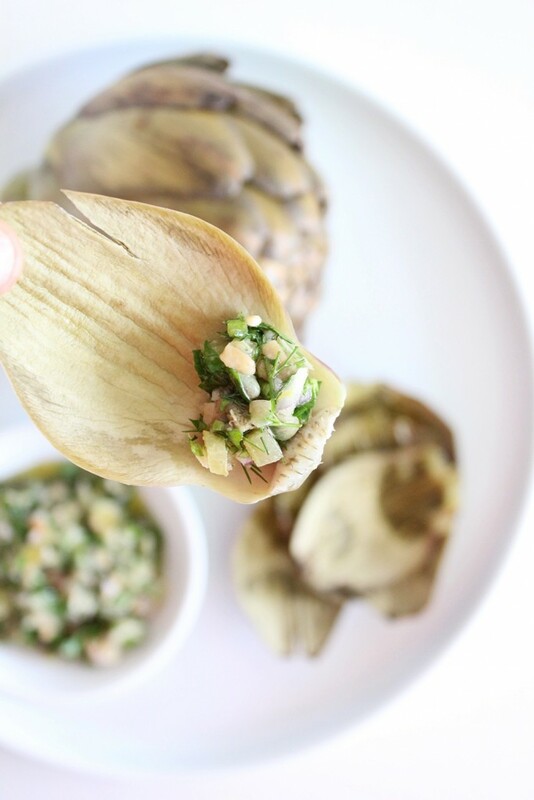 This gribiche makes so many veggies come to life, try it on roasted fennel, drizzled over steamed kale or fresh radicchio. It’s also a good way to top off your hummus or nut-based cheese. 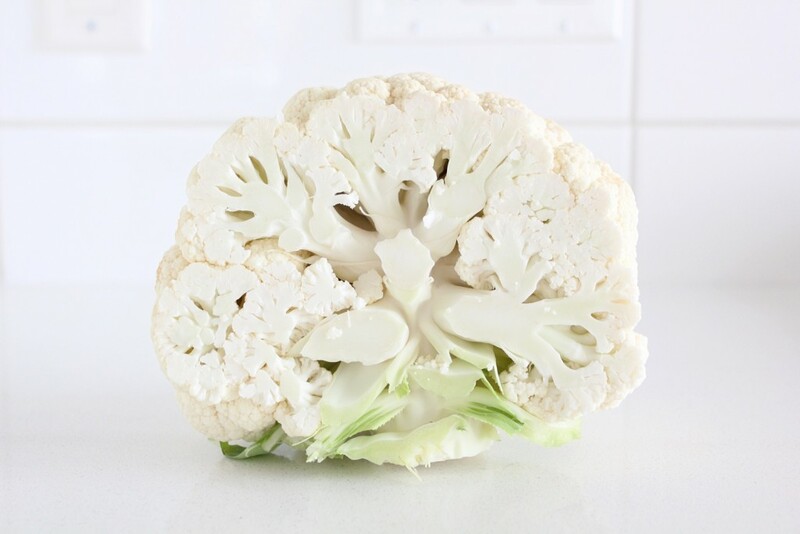 Lay the cauliflower out on a parchment-lined baking sheet and smear the coconut oil over it.